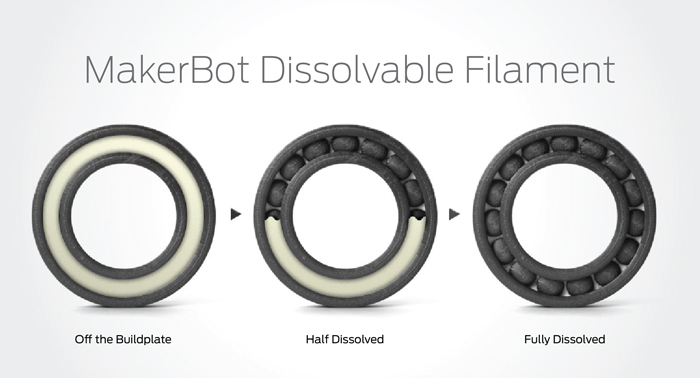 After months of watching updates that included cat shaped infill patterns and other nonsense, MakerBot has finally released their official support for dissolvable HIPS support material based on the research done here at 3DPPVD. They have branded their new filament line MakerBot Dissolvable and made it available to be shipped on the day of the announcement. MakerBot has priced their new filament at $65 a kilo which is an over 60% markup to the same material offered by Filaco. With this new material MakerBot has also upgraded MakerWare to support printing support structures on a secondary extruder. Now on a dual extrusion machine, HIPS can be printed alongside ABS without the need to generate two separate models. They have also included color matching support and rafts for dual extrusion multicolor prints. This will eliminate colored scars in your prints from the removal of a different colored support material. You can read more about our research into soluble support material here and find out more about MakerBots announcement here. Finally, don’t miss Hack A Day’s coverage of some of our advanced materials research that was on display at this years World Maker Faire.